Start by preparing your inside pockets. 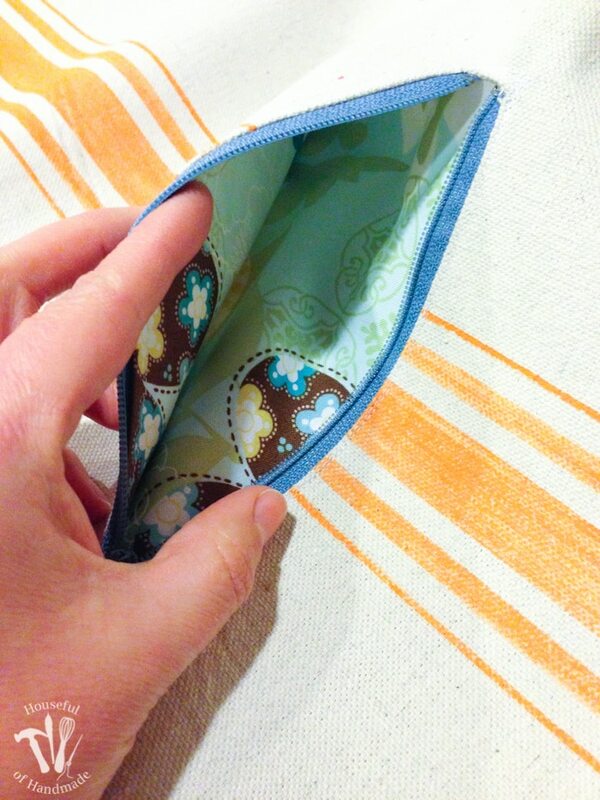 If you want pockets on both sides of the purse, cut 2, if you only want them on one side, cut 1. Fold the inside pocket piece in half with the right sides out. Iron the seam flat. 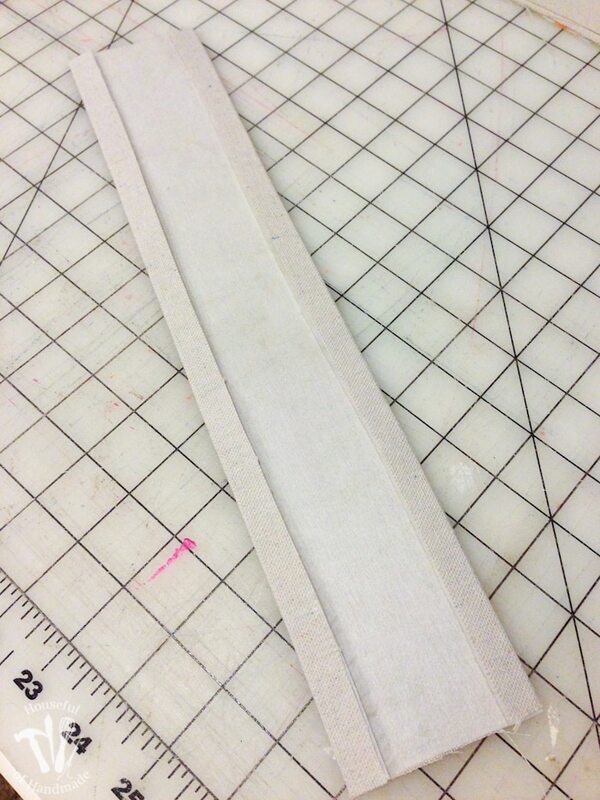 Then sandwich the unfinished seams inside a strip of bias tape. 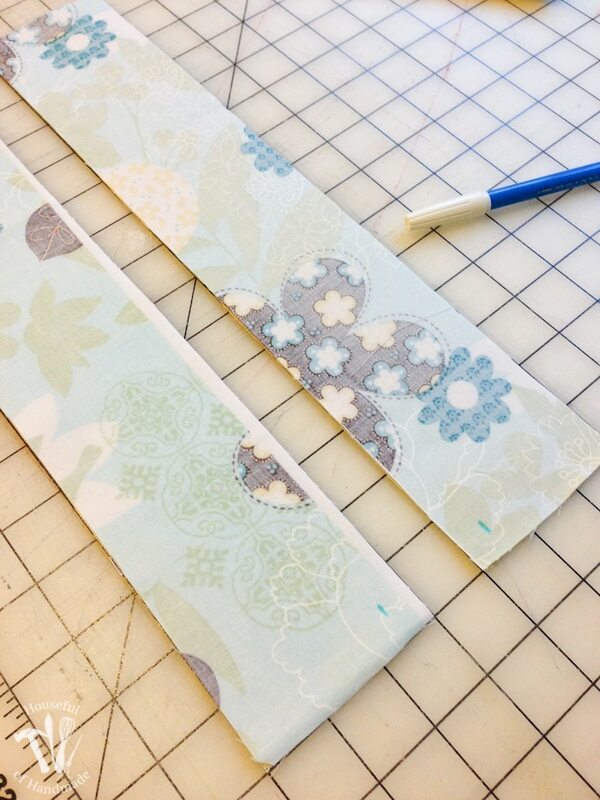 Sew down the bias tape to enclose the edges of the fabric inside. Now line up the pocket pieces with the front/bottom/back piece. 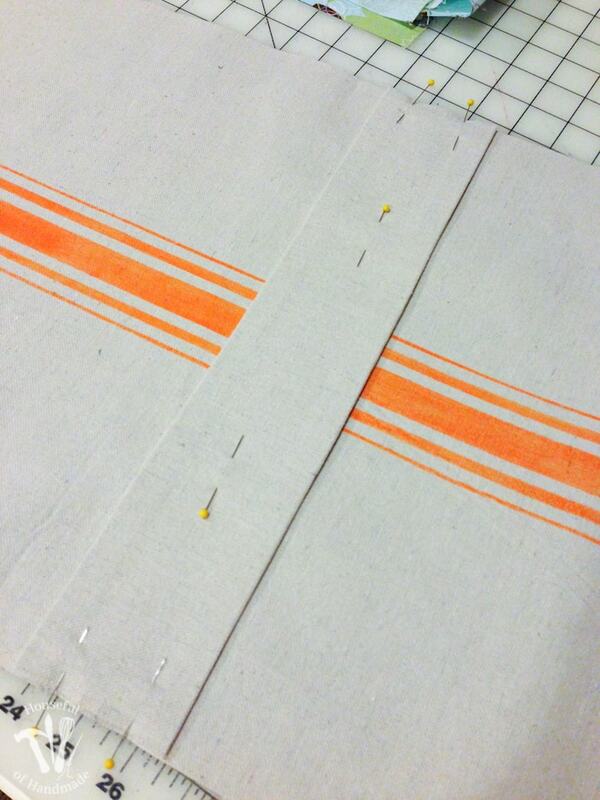 The top of the pockets (the side with the bias tape on it) will be lined up along the green dotted line. Pin it well. Sew along the entire bottom of the pocket piece. 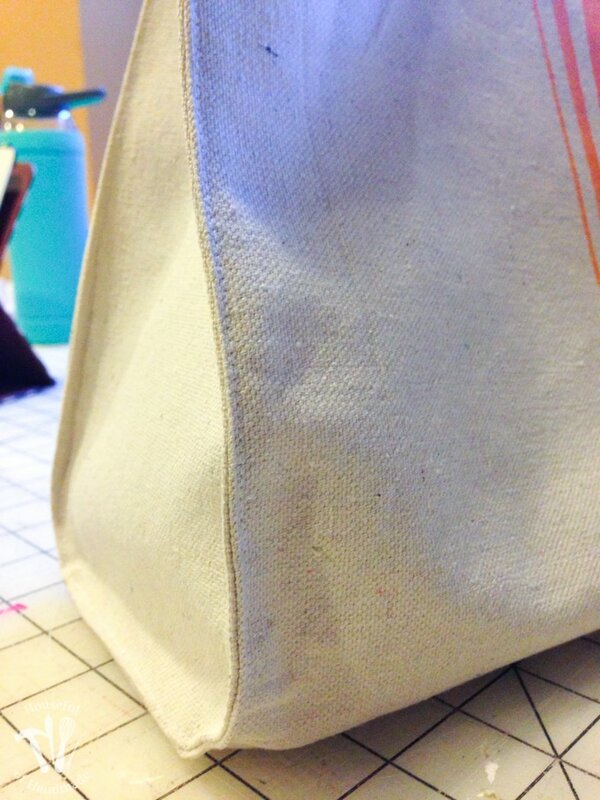 I did two seams 1/8″ apart for extra strength. Then sew the center from the top of the pocket to the bottom of the pocket to split the one large pocket into 2. 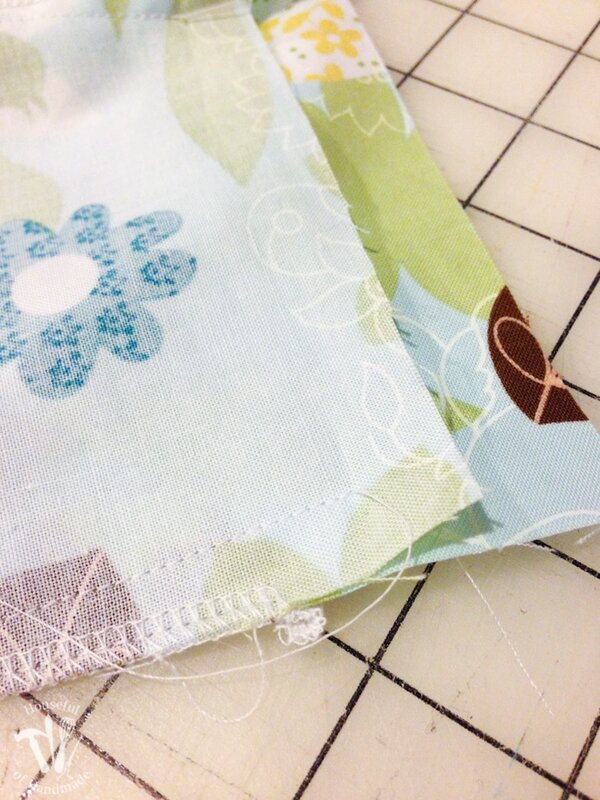 Again, I sewed 2 seams 1/8″ apart. Next, line up the front/bottom/back piece (with the pockets laying flat) with a side piece. Line up the notches and green dots. Then sew from green dot to green dot, enclosing the edge of the pockets into the side seam. 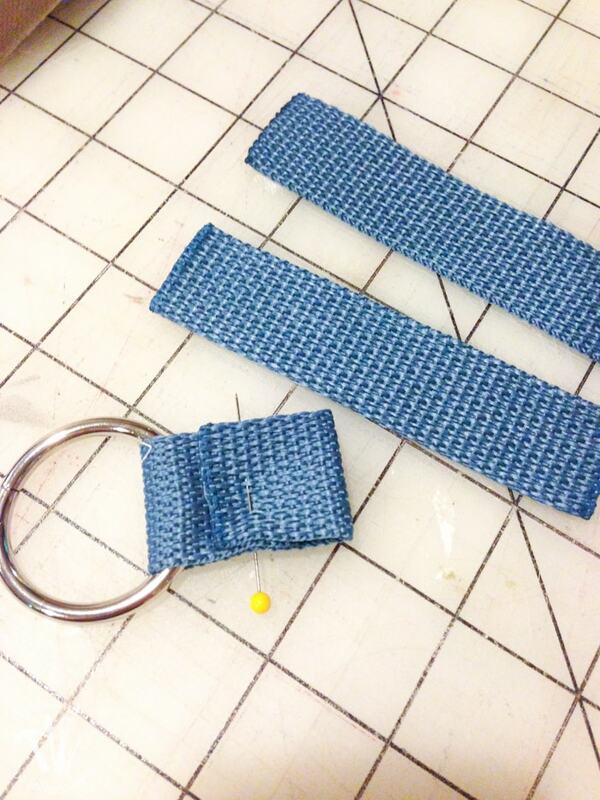 Time to add the pocket to the outside of the purse. First we will add the zipper. Cut along the solid lines you traced at the beginning, then fold along the dotted lines and press. You will have a nice flat opening in the purse outside fabric. 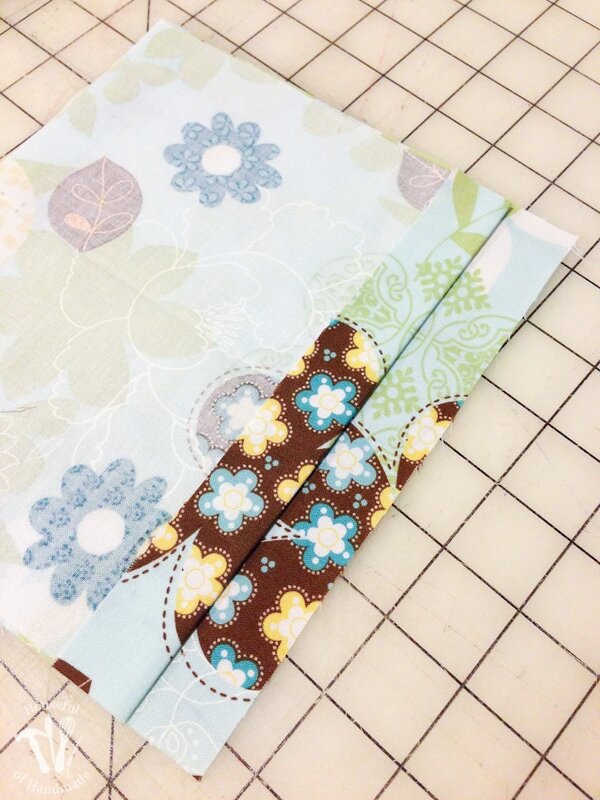 Center a 7″ zipper behind the opening and pin into place. 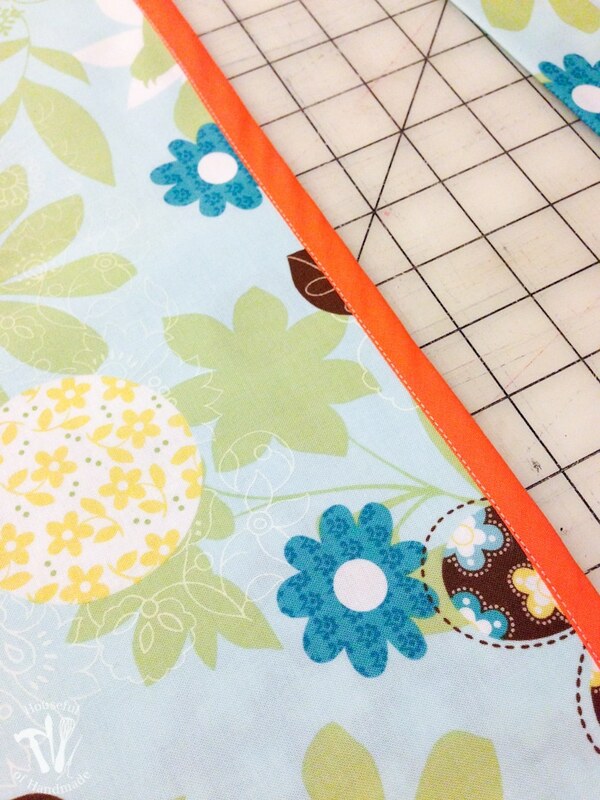 Sew all around the opening 1/8″ away from the center edge. 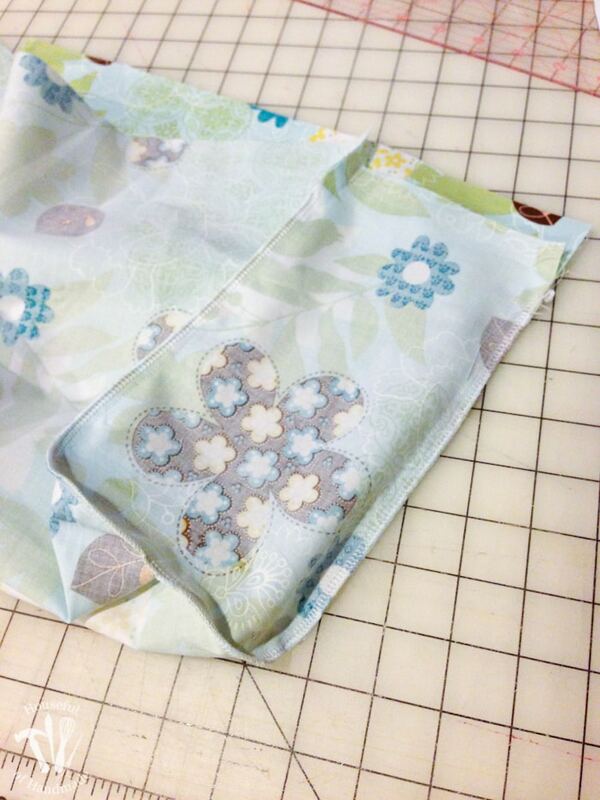 Pin together the outside pocket lining pieces and sew from green dot all around 3 sides to green dot. Fold over the unsewn edge on one half and press flat. Pin the folded over seam to the bottom of the zipper on the back side of the front/bottom/back piece. 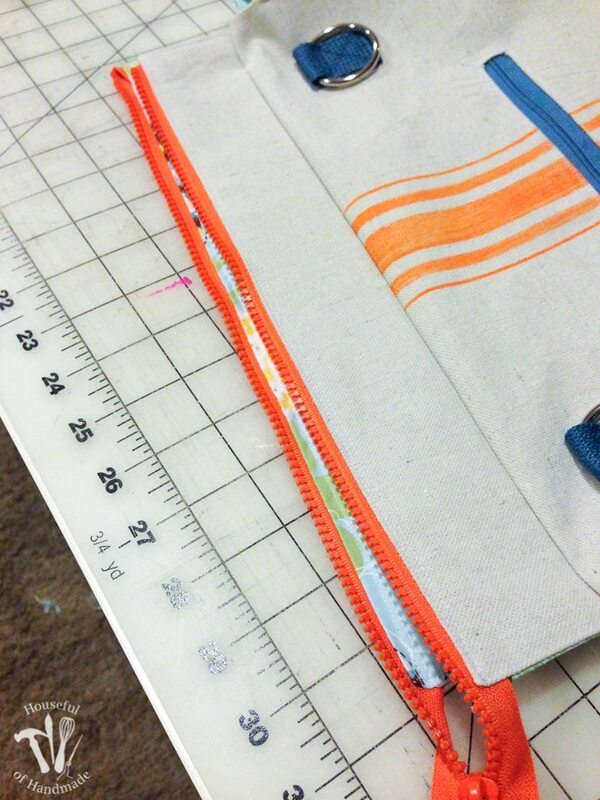 Then sew along the bottom line you sewed to secure the zipper, but make sure you only catch the one folded over edge. 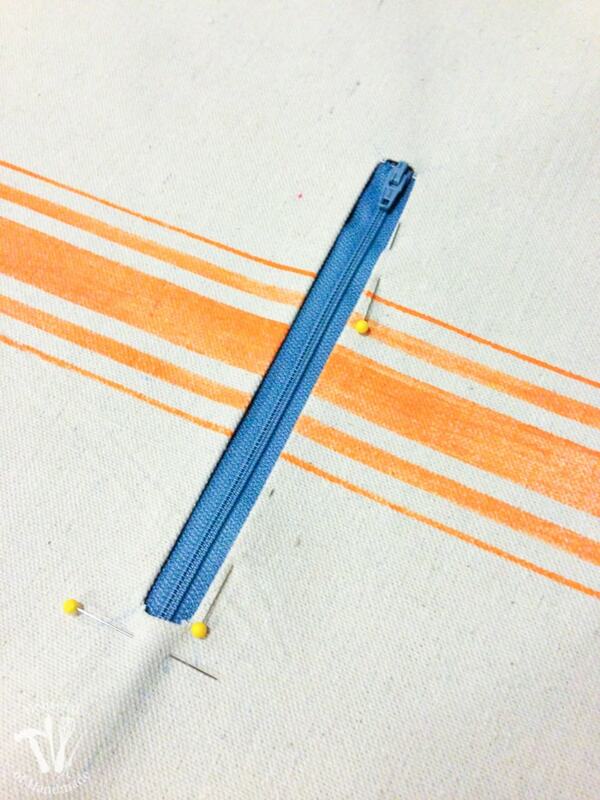 I do this by placing the unfolded side of the pocket lining under my sewing machine arm to keep it out of the way. Next you will flatten the unfolded side of the pocket lining and sew the remaining 3 sides of the box you sewed to secure the zipper. 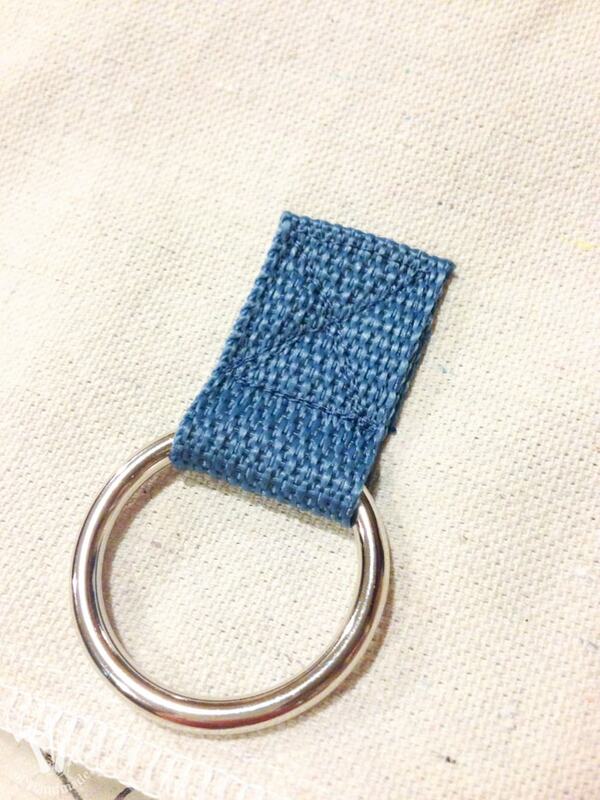 This will secure the top of the pocket lining to the purse. 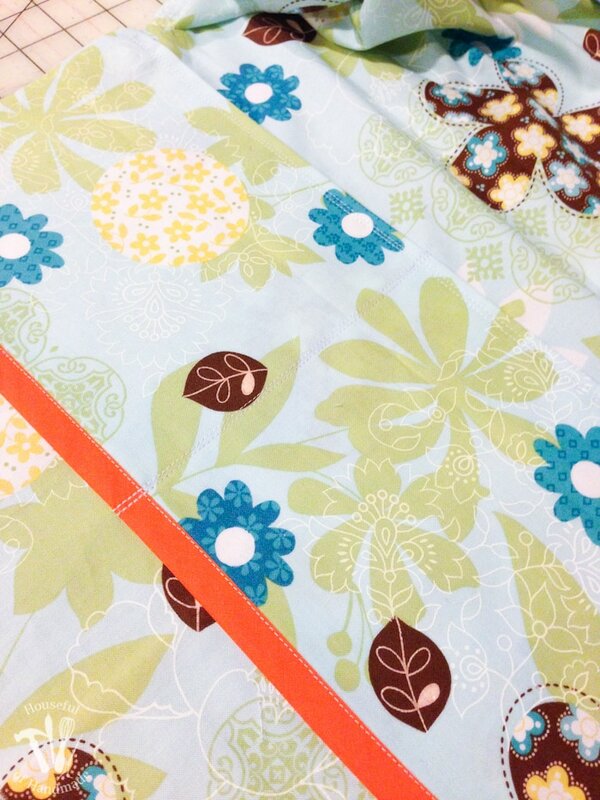 You can unzip your pocket now and see the fun lining fabric. Now grab the bottom reinforcement piece and iron the fusible web to the back of the fabric. 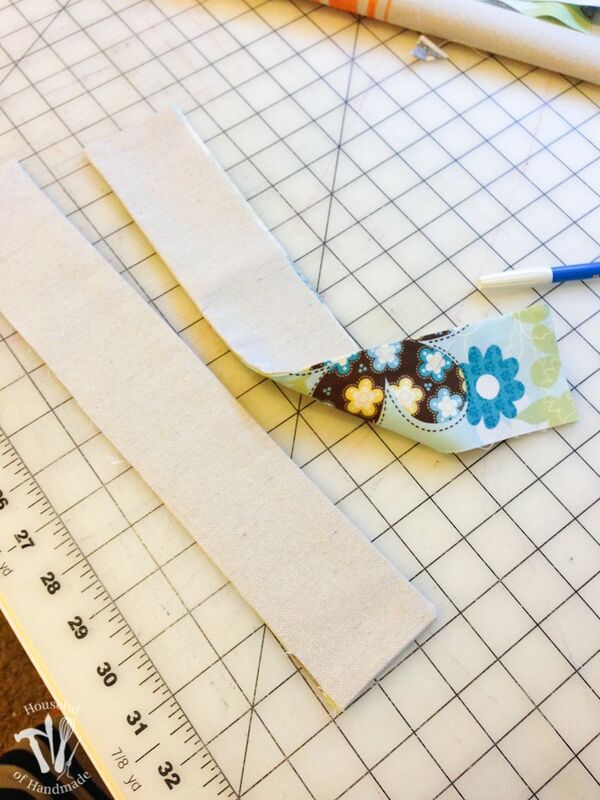 Then fold over 1/2″ on each long side of the piece and iron flat. Pin it to the center of the front/bottom/back piece, lining up the notches. Sew along both folded sides 1/4″ away from the edge. 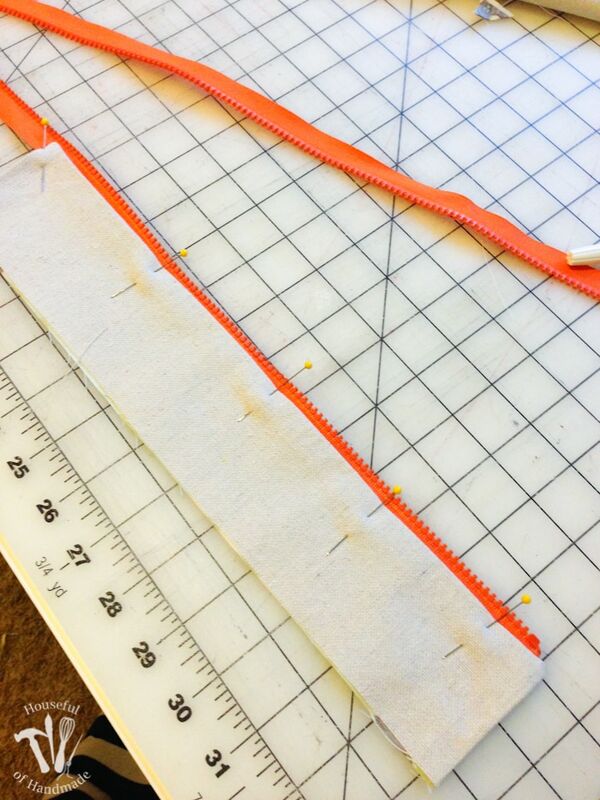 On the outer side pieces, fold the top down 1/2″ (at the green dots) and iron flat. 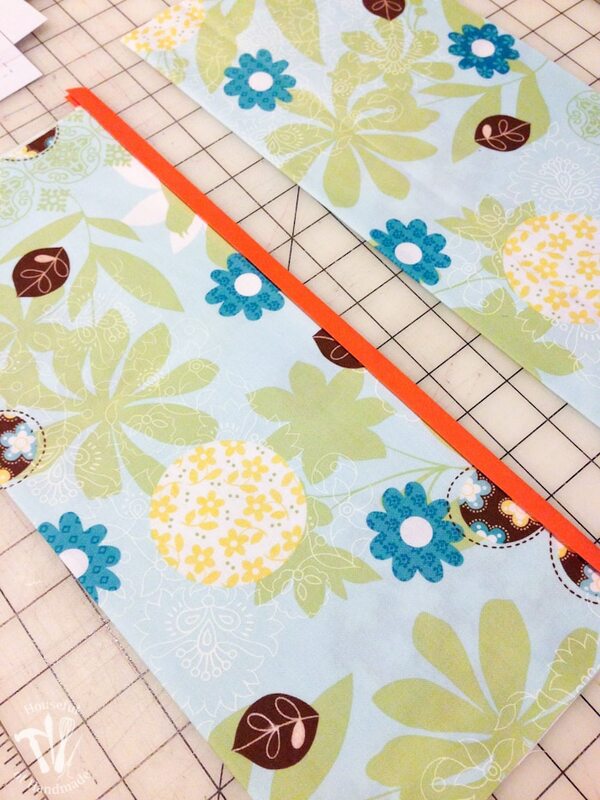 Then line up a side piece with the side of the front/bottom/back piece, lining up the notches and green dots. While sewing, make sure to keep the side pieces folded. 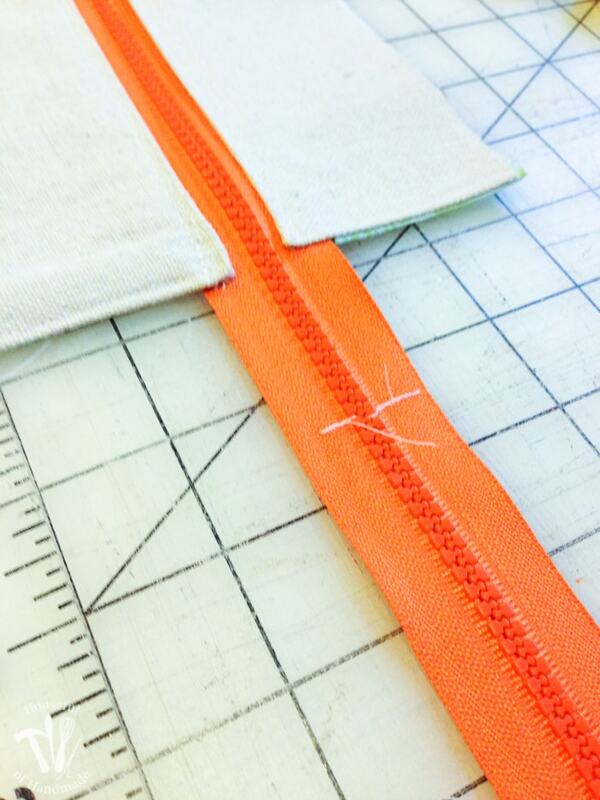 To give some dimension to the sides of the purse, I topstitched the edges of the side pieces 1/8″ in from the edge. It gives the purse sides some structure too. Next prepare the tabs to hold the handles on. 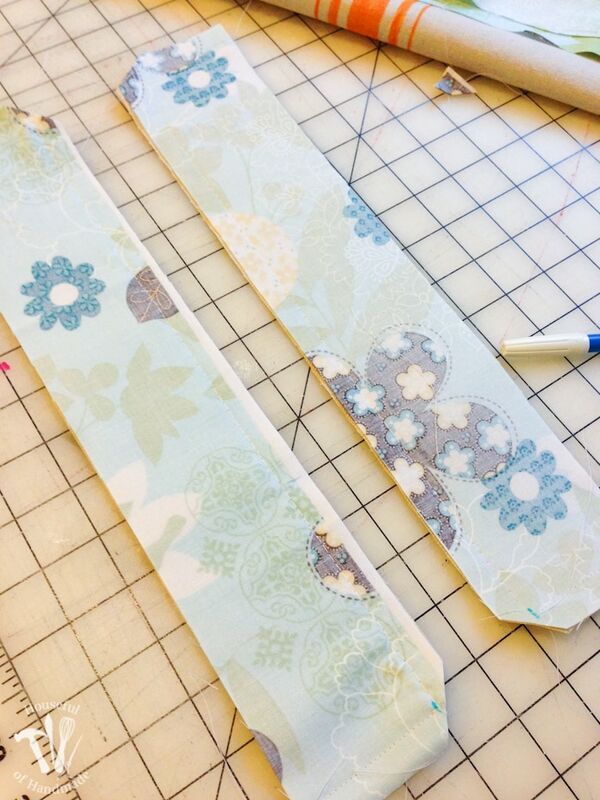 You can cut out the pattern piece for the handle tabs and sew them into a tube with right sides together, then turn it out or do what I did and use a 4″ piece of the 1 1/4″ strapping that I used for the handles. 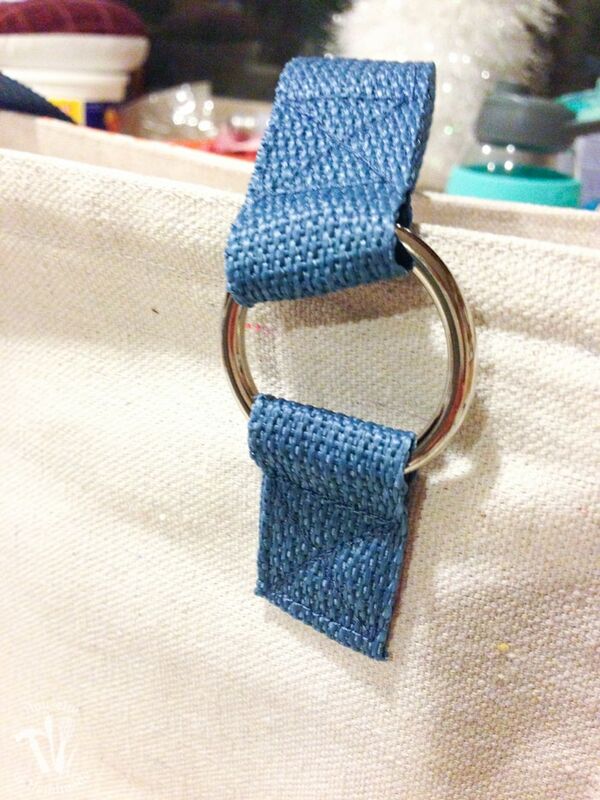 Fold it around the metal purse rings and pin. 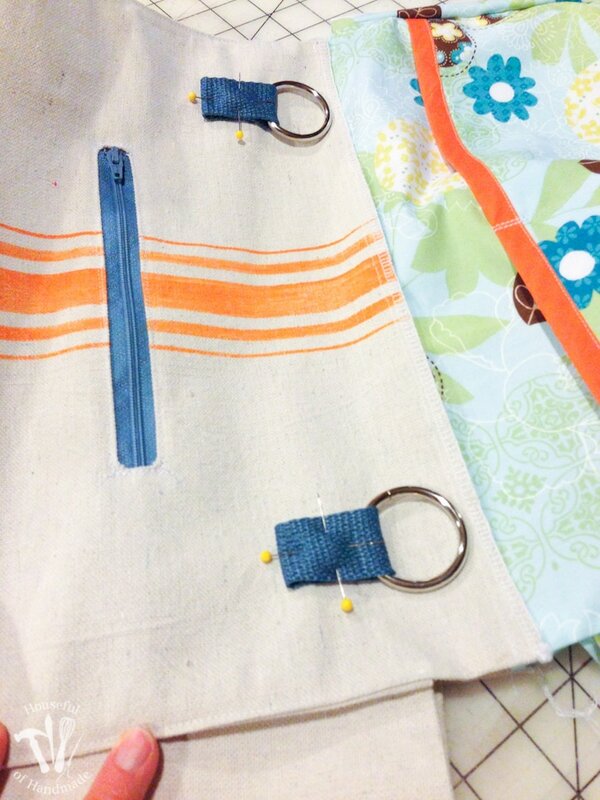 Then line the handle tabs up on the front and back of the purse. You may notice that I already have the lining attached in this picture (oops). 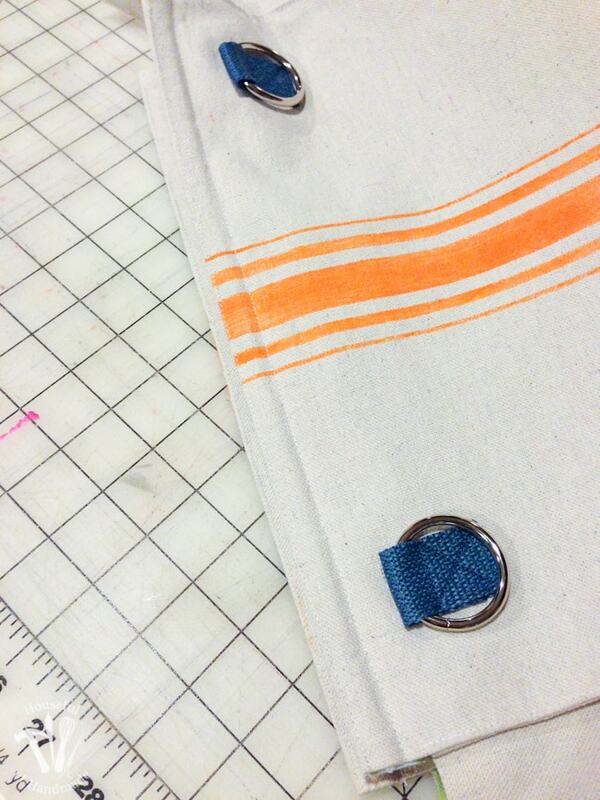 You want to make sure to sew the handle tabs on before attaching the lining (you know, do as I say not as I do). 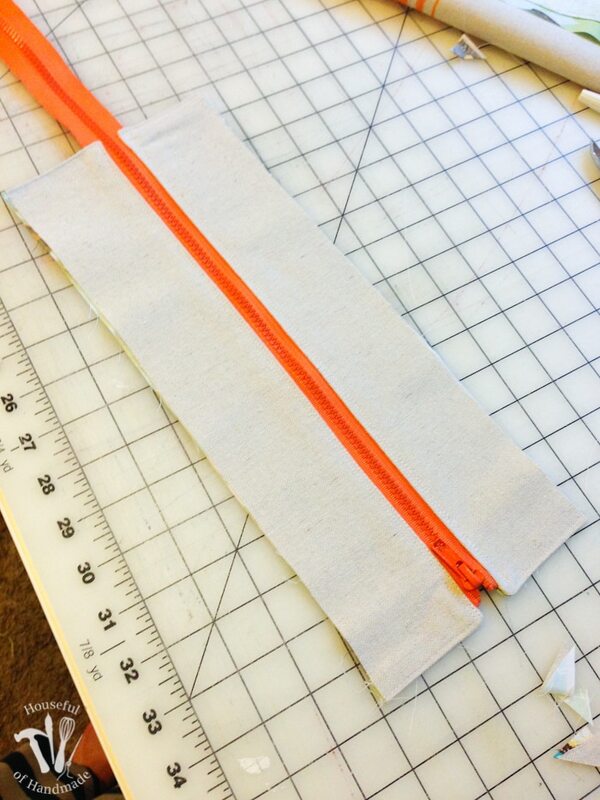 I lined my handle tabs 1 1/2″ from the top and 1 1/2″ from the side. 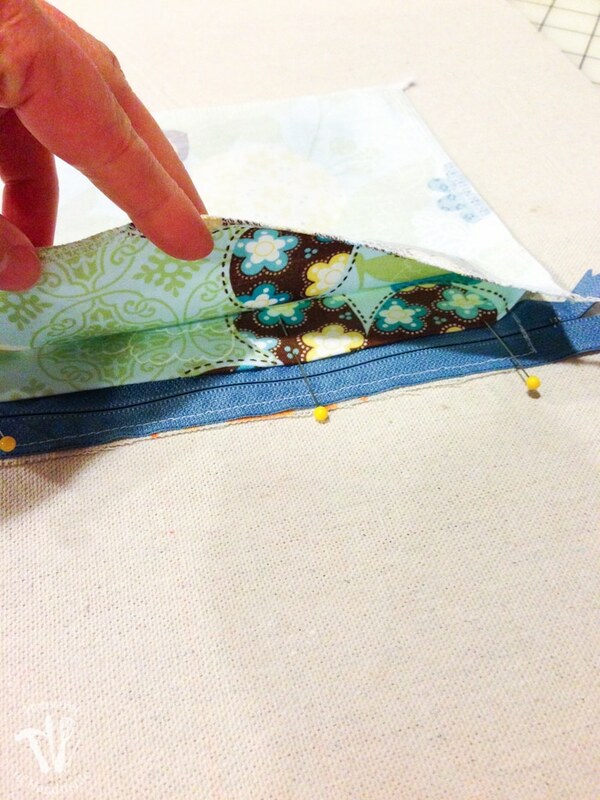 Pin into place and then sew securely. 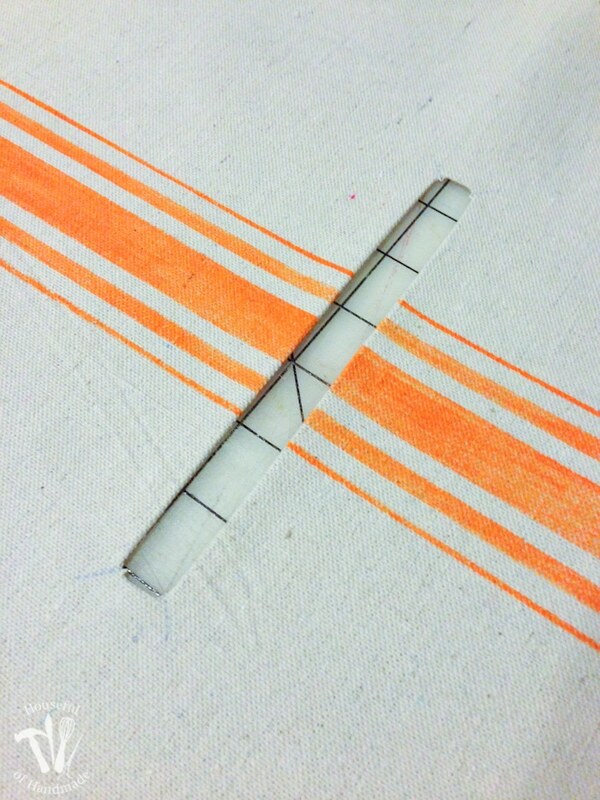 I sewed around the tab 1/4″ in from the edge then sewed an X inside. Repeat for the other 3 handle tabs. Now it’s time to insert the lining. Put the lining inside the purse with wrong sides touching. 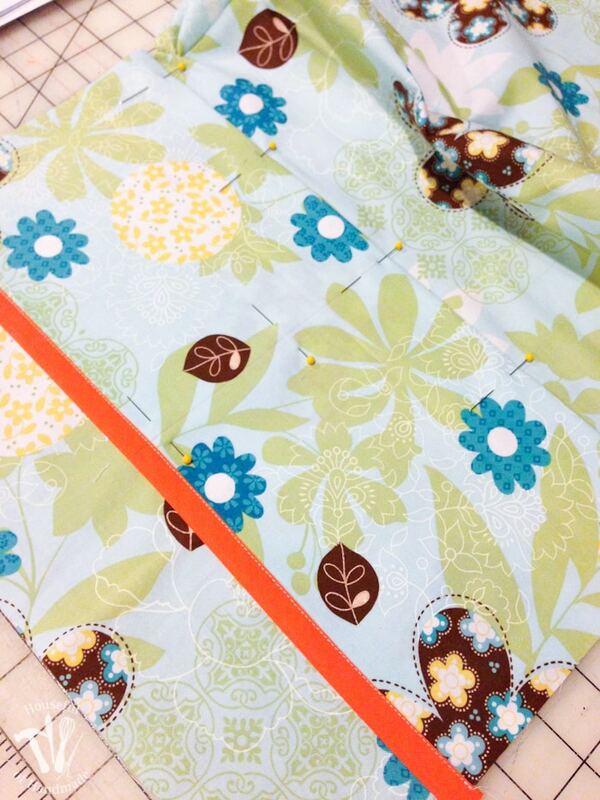 Then sew across the top on both sides with a 1/4″ seam allowance. Time to sew the top zipper section. Line up the lining with the outer fabric and sew the short side edge from the edge to the green dot (all but 1/2″ of the seam). Only do this on one side. Then sew the long side from the green dot to the edge and the other short side with a basting stitch and no backstitching. Repeat for the other piece making sure the pieces mirror each other (the regular stitched side is the opposite side). Clip the two corners. Then turn the piece so the right sides are out. Press the pieces nice and flat. Now remove the basting stitches along the one long side and the one short side. Your pieces will be attached on the one edge and have a nice flat fold on the other two sides. Take you zipper and sandwich it inside the one side of the piece. 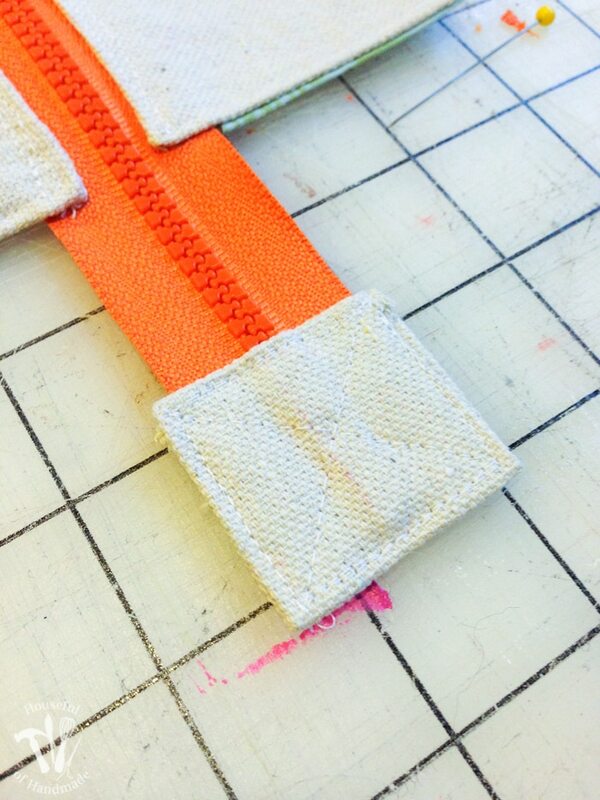 The top of the zipper should be at the sewn edge and the bottom of the zipper will extend past the end of the piece. 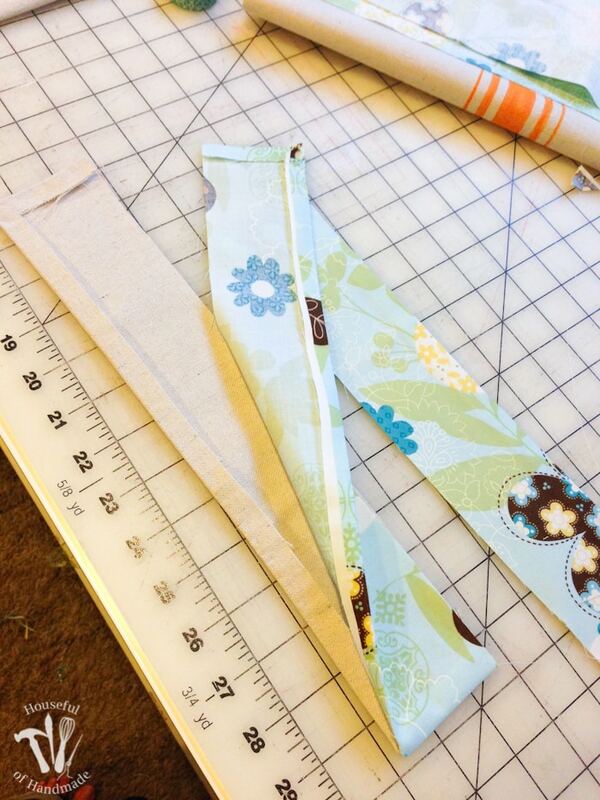 Sew along the two short sides and the long side by the zipper 1/4″ away from the edge to secure the zipper. You only need a 14-16″ zipper for the top of the purse, but I wanted the look of the larger teeth and could only find it in 24″ length. Once I got the zipper sewn into the piece I zipped it up and then sewed across the bottom a few inches below edge. Then I cut the excess zipper off. To make the back of the cut zipper look finished, I folded the sides and the top of the zipper tab piece in 1/2″ and ironed it flat into a little box. Then I placed it over the bottom of the zipper and sewed around the edges and and X over the center to secure it. 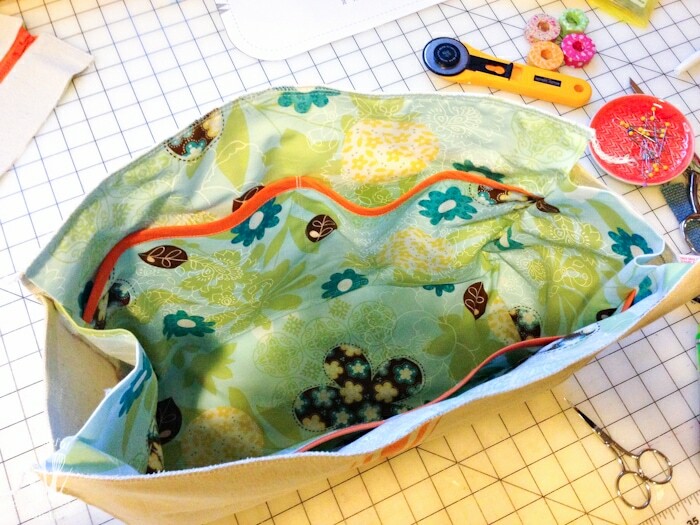 Line the top of the zipper pieces with the top of the purse and sew with a 1/4″ seam allowance. I could have ironed it and left it there, but I wanted to add some more dimension and structure to the top so I topstitched along the top line 1/2″ from the edge and 1/8″ from the edge. This also enclosed the entire seam to hide the unfinished edges. You will finish the purse by adding the handles. I used a 24″ piece of strapping and overlapped it 1 3/4 inches to give me plenty of room to sew a box and X to secure it. 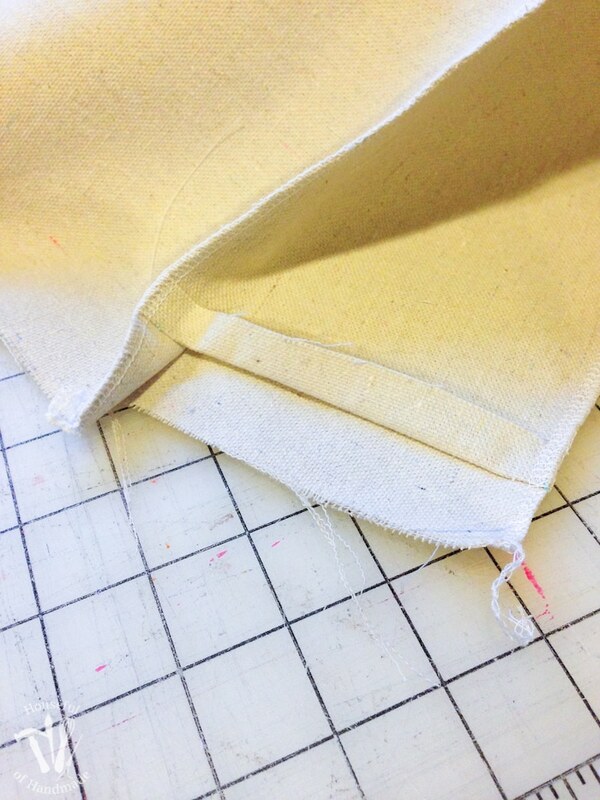 Then I used a little hand stitching to secure the lining to the outer fabric on the top of the sides. I forgot to get a picture of this (and since I am on vacation, you will just have to imagine it). 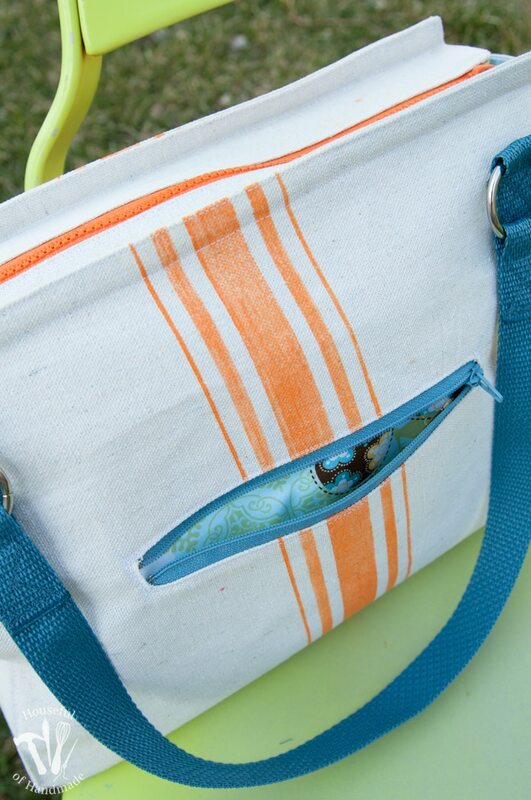 But it’ll be easy since it is the only open seam left in the entire purse. And now you are done! Pat yourself on the back, grab yourself a glass of wine, and then fill up your purse with all your stuff because it’s time to go out and show it off. Are you ready to make your own vintage inspired flour sack purse? The free printable pattern is in my library of free printables & downloads. Sign up for my weekly newsletter today to get access to my library of freebies where you can download this pattern (with supply list) and lots more!